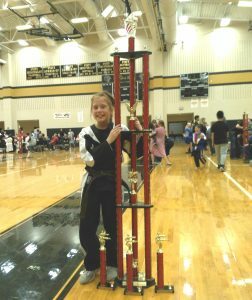 Katie Cardulla wins 6 feet tall Grand Champion Karate trophy on May 5 at Stone Tiger Martial Arts Tournament in Rockford, Ohio. Katie Cardulla was 8 years old when she first started karate at Tama Martial Arts. Her parents were trying to find a sport for her to do that best suited her. Her mother was a former brown belt in Tae Kwon Do and quit practicing when she got pregnant with her first child. So mom suggested Katie give karate a try. 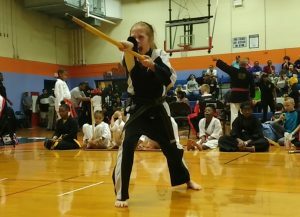 Nearly 3 years later, nearing 11 years old, Katie is a first kyu brown belt, a 3 time Grand Champion karate winner, and has won several 1st Place trophies. Katie says her inspiration for karate at Tama Martial Arts is her mother since she used to do Tae Kwon Do in her earlier years. Katie hopes to do her mom proud by making great achievements and surpassing her mom’s level, which she already has. Her goals in karate are to earn her black belt and use the training and knowledge she learned to empower herself in everyday life. Katie enjoys her training classes at Tama. She loves how the instructors make it fun and challenging. At times, by adding games to the teaching and how it prepares the students for whatever comes their way. So when she heard about the tournament team tryouts, the thought of winning trophies sounded cool and decided to give it a try. Since joining Tama and the tournament team, Katie’s self-confidence has improved now that she is a high-ranking belt. She loves to teach the 4-6 children Mighty Mites classes. And since she’s dealing with little ones, she also learned to have patience with them real quick. This also includes teaching and training with the middle and high belts. Several of Katie’s peers when she first started are also brown belts now. They are the “upper-classmen” and are looked upon to set the example and lead the way. Master Taningco encourages all his students by instilling discipline and respect and makes them feel good about themselves and in turn, they challenge themselves to do better. You can often hear Master “T” have the students chant “I am a champion!” and “I believe in myself!” These statements are great self-confidence builders. Katie’s self-confidence shows when performing at tournaments. She pushes herself to do the best of her ability. 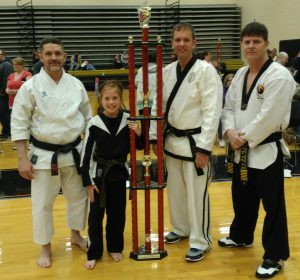 She’s won Grand Champion Karate three times and won 1st Place countless times. At a recent tournament, one judge awarded her a perfect 10 on her open hand form. Talk about a shocker! However, she has placed 2nd and 3rd as well. She uses those times to strive to do better. Karate has been a great activity for Katie. Being under Master Taningco’s teaching, Katie has learned and improved her self-confidence, discipline, respect, honor, and patience. Her parents are grateful for these qualities and are proud how far she has soared with her achievements. Other than winning 3 Grand Champion karate trophies, Katie also has other hobbies she enjoys. She’s an aspiring baker and cooks. She searches up recipes online and tries her hand at baking cakes and other desserts, dinner entrees, and after-school snacks. Katie even received a bunch of cake decorating accessories as a gift from a fellow karate student’s mom who didn’t use them anymore. She was so excited! Her favorite school subject is math. She likes it because her math teacher makes it be fun and challenging. She also maintains a straight A average in school and has received a Presidential Award Certificate for her academic achievement.